Email marketing under GDPR essentially means that, as an email marketer, you need to collect freely given, specific, informed and unambiguous consent. The new European regulation applies to both B2B and B2C business methods. Important to keep in mind is also that neither soft opt-in nor soft opt-out approaches are allowed. 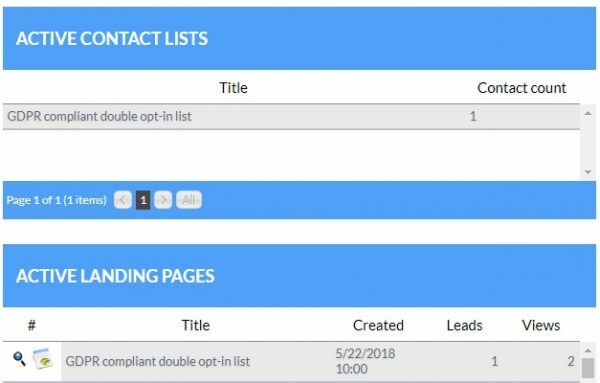 At SquizMAIL we recommend you to use double opt-in contact lists to align with GDPR compliance requirements. For consent to be valid under GDPR, a customer must actively confirm their consent, such as ticking an unchecked opt-in box. Pre-checked boxes that use customer inaction to assume consent aren’t valid under GDPR. 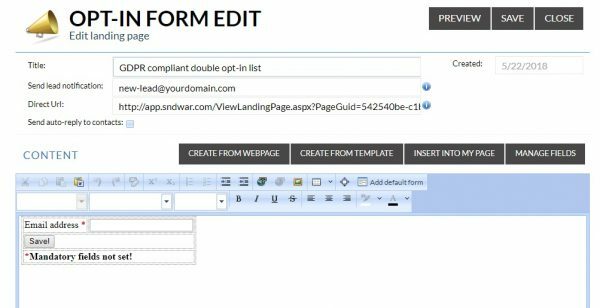 How to create a double opt-in contact list in SquizMAIL? Go to Contact list management and create a new contact list. Make sure you select “Static” type list and from “Sign-up form” drop-down menu select “Yes, but request confirmation via email (double opt-in)”. You should now see “edit sign-up form” button. Click on it to start editing sign up form. Enter your preferred email address into “Send lead notification” field (you will be notified when a new lead is added to this contact list). Direct URL is where this sign-up form is accessible to your audience. Or you can integrate this sign-up form to your webpage by copy-paste form’s HTML code. You can get the code by clicking on “Insert into my page” button. Enter all information’s (what does It mean to be subscribed to this list) that are required to be compliant with GDPR law. When done editing simply click on “Save” button and make a simple test. Go to sign-up form direct URL, enter test data and click submit button. You will get “Data successfully sent!” notification and at the same time SquizMAIL will send you a confirmation URL to entered email address. At SquizMAIL dashboard look for your sign-up form inside “active landing pages” section. Click at “view leads” button to see all leads that entered data (leads are those who already click at confirmation link and those who hasn’t yet). Or click at “Analyze results” button to see form’s analytics (contacts report, timeline, event by location). You now know where you can find leads. But if you check your contact list you will see that your email is not yet in it (hasn’t been confirmed yet). So let’s go and finish/confirm double opt-in process (until confirmation link is clicked, email address is not added to contact list). Click at confirmation link that has been send to your email address. You will get a notification that look like that: “You have been successfully added to mailing list”. Double opt-in process is now completed. Go back to contact list management inside your SquizMAIL account and double click at your newly created double-opt contact list to confirm your email address is in. You can now use this email list in your email marketing activities.